OEM Manufacturer of a wide range of products which include butyl rubber stopper, railway rubber part and bromo butyl rubber stopper. We have emerged as the leading organization that offers a wide range of excellent quality Butyl Rubber Stopper. This stopper is manufactured using premium quality rubber with the inculcation of advanced technology. Keeping in mind varied requirements of our esteemed clients, we offer this stopper in varied specifications. Also, we make sure that offered stopper is checked on various quality parameters by our quality personnel. This stopper is offered at the most reasonable price to the clients. 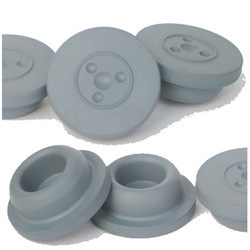 We are offering a wide range of Grey Bromo Butyl Rubber Stoppers. They are widely known in the pharma packaging terminology are used to seal vaccine bottles, serum vials, injectables, saline bottles and ear/ eye drops etc. 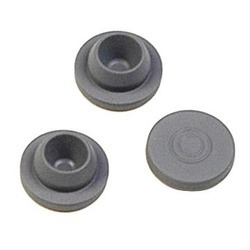 We offer our range of Grey Butyl Rubber Stoppers at most affordable prices. Manufacturing rubber stoppers, plugs, discs as per drawing, samples, materials Butyl, Bromo Butyl, Natural.